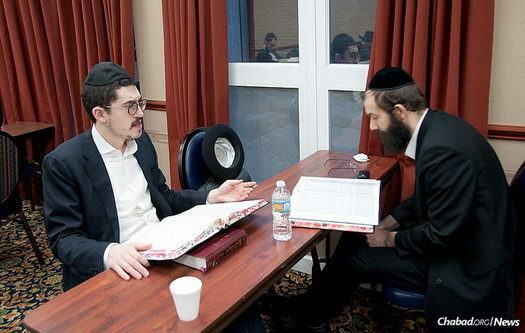 Investment advisor Akiva Goodman, left, learns with his study partner at the Bnei Ruven morning Kollel in Chicago. It’s a tradition almost as old as the Chabad movement itself. 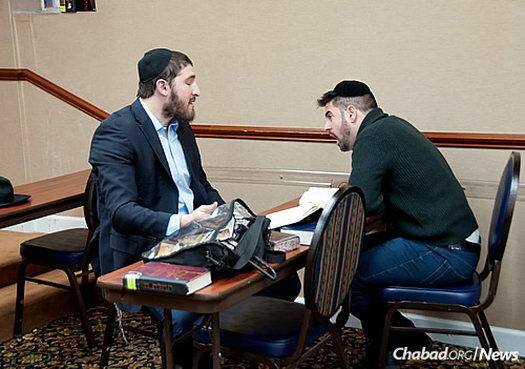 Every year, Chabad-Lubavitch communities divide up the entire Talmud, each individual studying another tractate and celebrating a grand siyum when the effort is complete. Investment advisor Akiva Goodman enjoyed the study, but thought that some of the technology he uses in his workplace could help individuals track their learning and become inspired by the learning of others. The end result turned out to include a smart sign-up system, online progress reporting and large screen in the synagogue lobby, where everyone’s accomplishments are displayed. While Goodman developed much of the back end himself, he got help from his study partner, Zev Shkolnikov, a former Google developer. “We wound up consulting during the breaks from studying Tractate Megillah,” says Shkolnikov, whose coding expertise made the system smoother and more intuitive. The custom of dividing the Talmud in each Chassidic community was established by Rabbi Shneur Zalman of Liadi, the first Chabad Rebbe. 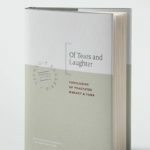 The Rebbe—Rabbi Menachem M. Schneerson, of righteous memory—once explained the appropriateness of this date: Although comprised of several seemingly disparate parts, the entire Torah is essentially one entity. This wholesomeness of Torah is only achieved in the presence of the revealed and hidden elements of Torah, represented by the Talmud and Chassidism, respectively. Thus, it is natural that the division of the Talmud was established on the 19th of Kislev, when Chassidism is celebrated. According to an article in A Chassidisher Derher magazine, back in the 1940s the Rebbe would organize the divisions on behalf of Machne Israel, including participants from all origins. Throughout the years, the Rebbe would observe the division of the Talmud at the central Yud Tes Kislev celebration in the main Chabad synagogue in Brooklyn, N.Y.—personally participating, filling out an index card with his name and the tractate of his choice. 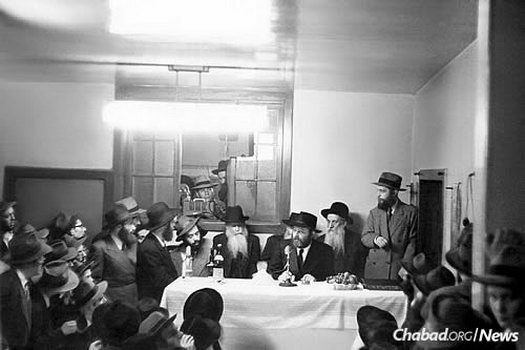 With the exception of 1952, when the conclusion was made by Rabbi Meir Ashkenazi, former chief rabbi of Shanghai, the Rebbe himself would ceremoniously complete the Talmud on behalf of all the participants. In Chabad synagogues large and small, a big board is often hung displaying the names of the participants in the Talmud campaign, indicating what each individual has accepted to learn. 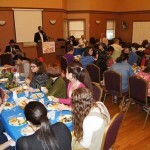 To sign up your community, please email admin@siyum.org or visit siyum.org. 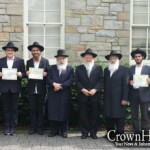 Goodman and his study partner, Zev Shkolnikov, a former Google developer, came up with a smart sign-up system, online progress reporting and large screen in the synagogue lobby, where everyone’s study accomplishments are displayed. How could you not be inspired to learn with such chizuk? Would love to see it in my shul, and in your shul to.